Franco was really patient. He explained the process and the options to me, and he let me steer the ship. Franco was comprehensive in his knowledge, so he was able to do the work that I asked him to do. The price was right, and we were able to work out a schedule that worked well with my time constraints. Franco is very clean and picks up after himself. If it's work that's being done while you are living in your home at the same time, it's great. Also, he does the work perfectly. I really like Franco's skills, reliability, and that he cleans up after himself so well. Franco is reliable, he cleans up after himself, and he's talented. They're reliable, they clean up after themselves at the end of every work day, and they worked really hard to meet our timeline. FC Remodeling provides handyman services, remodels kitchens and bathrooms, and takes on various general construction jobs for residential clients throughout the North Bay and East Bay. The company has the training and equipment to work on every step of its customers’ renovation projects, from interior and exterior painting to window, door, and cabinet installations. 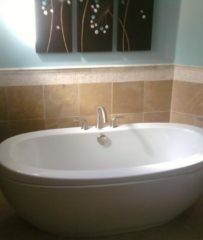 FC Remodeling recently completed this bathroom remodel. 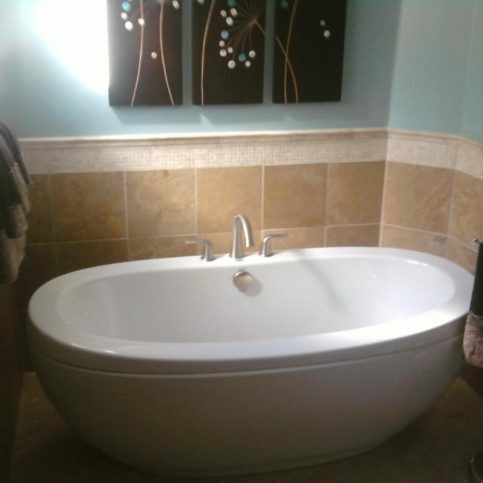 FC Remodeling has been providing handyman services, remodeling kitchens and bathrooms, and taking on various general construction jobs for residential clients throughout the North Bay and East Bay since 2009. The company works on projects of every size, from small home repairs to full-scale kitchen and bathroom remodels, and its in-house capabilities include everything from interior and exterior painting to window, door, and cabinet installations. If you’re taking on a home repair project, look for a handyman contractor that’s knowledgeable about local codes. State and city codes mandate design and building specifications, including the height of railings and windows, the types of materials used, and special installation requirements. Whether you like them or not, you and your contractor are required by law to abide by code regulations. So, as a homeowner, you’re ultimately responsible for working with a contractor that understands and abides by these codes; otherwise, you could be held liable for repairs. Q: How long will it take to complete my job? A: It depends on a lot of factors, but once we analyze the scope of work, we’ll be able to give you a realistic timeframe for your job. Q: Can you help me design my remodeling project? A: Yes. We’re not designers, but we can give you advice or seek outside help if you’re looking to incorporate a lot of design work. Q: Do you give honest bids? A: Absolutely. Price is usually the bottom line for our clients, so we’re careful with our estimates and focus on providing the most honest prices possible. We’ll also give you a choice between a fixed bid and a ‘time and materials’ bid. Q: Will you handle the permitting process for me? A: Yes, we’ll go to the building department and acquire the necessary permits for your job. That way, you can concentrate on other details, like picking out materials. Q: What can I do to move my job along faster? A: Half of the battle is getting the materials, so you should do some research and determine what your preferences are in terms of aesthetics and styles. Decide what you want before you start and price the materials so you have a realistic budget. The more you narrow the scope of your job, the more it will help the construction process. Franco Corvasce is a 15-year veteran of the remodeling industry and owner of FC Remodeling, a Diamond Certified company since 2015. He can be reached at (415) 801-4071 or by email. A: Summer—there’s just more to do, and my kids and I get to go camping and take road trips. Q: What’s your favorite style of music? A: I like anything that has guitar, whether it’s rock and roll, blues or jazz. I just like the sound of the guitar—plus, I like to play it a little bit. RICHMOND — One of the most important home maintenance steps you can take is to seal gaps and seams in your kitchen, bathrooms, and other moisture-prone areas. Even in the case of small cracks or gaps, if water is able to penetrate, it can lead to severe dry rot and potentially cost you thousands of dollars in repairs. Fortunately, this is easy to do: all you need is some caulk, a caulking gun, a sponge and a bucket of water. Using your gun, apply a single bead of caulk along the seam or gap you want to seal. Next, wipe it with your finger to push it into the gap. Then, take your sponge (slightly dampened) and wipe the caulk again to smooth it out. Use the water bucket to rinse your sponge between applications. Basic areas that should be sealed include cracks in tile grout, gaps in between the bathtub/shower and tile, and the area between the kitchen backsplash and the wall. Following application, inspect these areas every year and reseal as needed. RICHMOND — Host, Sarah Rutan: When it comes to preventing water damage in your home, one simple maintenance step can potentially save you thousands of dollars in repairs. Today we’re in Richmond with Diamond Certified Expert Contributor Franco Corvasce of FC Remodeling to learn more. Diamond Certified Expert Contributor, Franco Corvasce: Okay. One of the most important things a homeowner can do to maintain their home is seal and paint all of the small gaps in their home. This is going to allow you to keep the water from infiltrating the home, which could potentially cause severe dry rot and damage and cost you thousands. But a small, simple step is just, in a bathroom, where there’s one of the most wet areas in your home, is apply some grout caulking. This is going to seal up any small fractures or gaps in-between the tub and grout, or tub and tile. What you’re going to want to do is apply a single bead along the seam or gap you’re going to fill. Wipe it with your finger. Have a nice half bucket of water, with a grout sponge. Get that damp. Make sure you squeeze the sponge out. And wipe your grout joint clean. FC Remodeling : Average 9.6 out of 10 based on 27 unique customer surveys of customer satisfaction. Franco did a great job. The job was very well done, and Franco didn't make a mess around the house. He was so much better to deal with than many other people I've used before. I recommend Franco to others all the time. The thing I always remember to say to them is that he is someone who does what he says he will do. He'll charge what he says he will charge and shows up when he says he will. It is usually hard to find someone in this business that does all three, and he really does. Franco's a very nice person, and he's easy to deal with. I like that I have confidence in him and that I know he will get the work done. His pricing is also very good. He is very knowledgeable, a skilled builder, and has a natural aesthetic sense for design and how things are going to look. He is very good at what he does, he is prompt, and he gets the job done at a good price. He does quality work. He was very cordial, and he was good at what he did. The prices are reasonable, and the quality of the work is outstanding. They're fabulous. I think they're a good choice. I really liked their professionalism. I was a happy customer. They're very honest and upfront about the cost of the job. In the end, the cost was exactly what he quoted me originally, which means a lot. Franco is an incredibly nice guy, and his crew is nice as well. He is a very nice guy who does good work. Franco is very thorough, communicative, and responsive. He also follows up on issues well. I like his thoroughness, communication, responsiveness, and follow-through. I would tell others how trustworthy Franco is and how everything went very smoothly, with no delays. There were some financial issues on our end that were difficult to work with, but Franco was very kind and generous with his time. He helped us through the process. It meant a lot to us that he was so patient. Franco was very honest. He was able to work with us to help us come up with good ideas and affordable alternatives for the things we wanted. That Franco came on time and showed back up when he was supposed to, he was great. He did a fantastic job. He came on time, returned to complete the work on schedule, and was very trustworthy. He was easy to work with. They really seemed to listen to what I wanted to have done. Franco is very reliable, and his work passes inspection the first time. That's important. Franco takes the extra time to make sure things are done very well. He doesn't just to get things done for the sake of being done. Franco has been really perfect for me. He comes in, doesn't make a mess, and he can do everything, including plumbing and electrical work. He also thinks ahead of time about what he needs to bring with him, so he is prepared for the job when he arrives. The finished product is great. Franco's work is perfect. Franco is a great guy and very conscientious about his work. He does high quality remodeling. I like working with Franco. He's really conscientious, took his time to do his work well, but was able to get it done within a reasonable time frame. He also had reasonable prices for the quality of his work. I'm still enjoying his work. He made my home a better place to be. Franco's a very pleasant person to work with. I liked the quality of the work and that Franco has a good eye for design. We were very happy with him. Franco does great work, and he's reliable. Franco is down to earth. Franco's very precise and very on top of things. Franco's work is great. The remodeling he did for me turned out beautifully. I'm satisfied with everything he did.